The physical layer interface is necessary for a chip to access the outside world, but it threatens to consume increasing portions of the power budget. What can be done to prevent a PHY limit? Physics has been on the side of chipmakers throughout most of the lifetime of Moore’s Law, but when dealing with the world outside the chip, physics is working against them. Pushing data at ever-faster rates through boards and systems consumes increasing amounts of power, but the power budget for chips has not been increasing. Could chips be constrained by their interfaces? While a chip with no physical data connections is theoretically possible, it is not practical. It would mean that all processing and memory were integrated on a single die, all sensors and actuators contained internally or interfaced wirelessly. And it would have no means to be accessed, updated, or even tested except through those wireless interfaces. As soon as a data signal passes from the chip to the outside world through the pins of the package, life becomes more difficult and it is the job of the physical layer interface, or PHY to deal with that high parasitic, noisy environment. The problem is created by a mismatch. The voltages and currents within a chip’s logic circuitry have been on a downward trajectory along with node sizes, but the dimensions of the outside world have not changed in the same manner. Wires outside the package are hundreds of times longer, and they have much higher capacitance and resistance. Inside the chip, processing has become faster, and that depends on getting enough memory throughput—or access to the raw data required—which in turn means that the external interfaces must operate at an ever-faster rate. Power is an issue for all chips independent of the power they consume. Low-power chips often are powered by batteries, so every mW matters. High-end servers often run into thermal problems and therefore have to fit within the limits imposed by their operating environment. The PHY design for each is substantially different, and it basically comes down to the timing reference used for each interface. In a serial link, each lane in a data link is self-sufficient. For the parallel interface, the clock is not embedded so you have to worry about skew between signals. That difference impacts the maximum frequency of the interface. For serial links, speeds of 28GHz are common, whereas parallel interfaces are running at 200MHz. This impacts the surrounding circuitry. A serial connection requires clock and data recovery circuitry. Parallel interfaces require a PLL or DLL to de-skew each data line. This comes about because the memory industry is very cost sensitive and the fabrication process is highly optimized for storage density, not for fast logic. 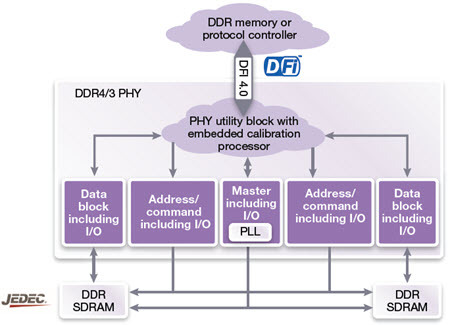 This limits the transfer speed, and the DDR interface is a reflection of the current assumptions associated with the boards, packages, connectors and DRAM technologies available. As is often the case, low-power states add latency. When frequency switching is performed, the PHY needs to be trained and initialized for that frequency. When you change frequency, you could save the training state of the lower frequency point so that when you switch back, there may be no retraining required. The MIPI Alliance has been the plumber for the mobile industry and now hopes to migrate that success into the automotive and IoT spaces. Part 2: What the PHY is all about and why it’s so important in the IoE.